Special District Risk Management Authority - Providing unparalleled property, liability, workers' compensation and health benefits programs. Let us provide you with a competitive quote guaranteed to save you money. FREE MemberPlus Services™ to help members prevent and reduce claims. Comprehensive coverage protection with consistent risk management for 30 years. Special District Risk Management Authority has provided comprehensive coverage protection with solid, consistent risk management solutions to California Public Agencies for over 30 years. Our primary objective is to serve as a single resource to meet all your risk management needs and we currently serve over 660 individual public agency members with over $4 billion in member insured property. Quality coverage protection and risk management services, responsive claims management, as well as tailored safety and loss prevention programs provide members with an unequaled risk management program. To ensure maximum protection of your public agency’s resources our current programs include Property/Liability, Workers’ Compensation and Health Benefits along with our valuable MemberPlus Services™. We also partner with several important companies to provide valuable industry leading programs at no cost to our members including; TargetSolutions™ online training and certification tracking, Company Nurse telephone triage program, Lapidus Safety Consulting for loss prevention and safety visits and an Employment Law Legal Hotline using Best Best & Krieger! In addition, if you belong to both our Workers’ Compensation and Property/Liability Programs you automatically receive a 5% discount off the annual contribution amount for each program! 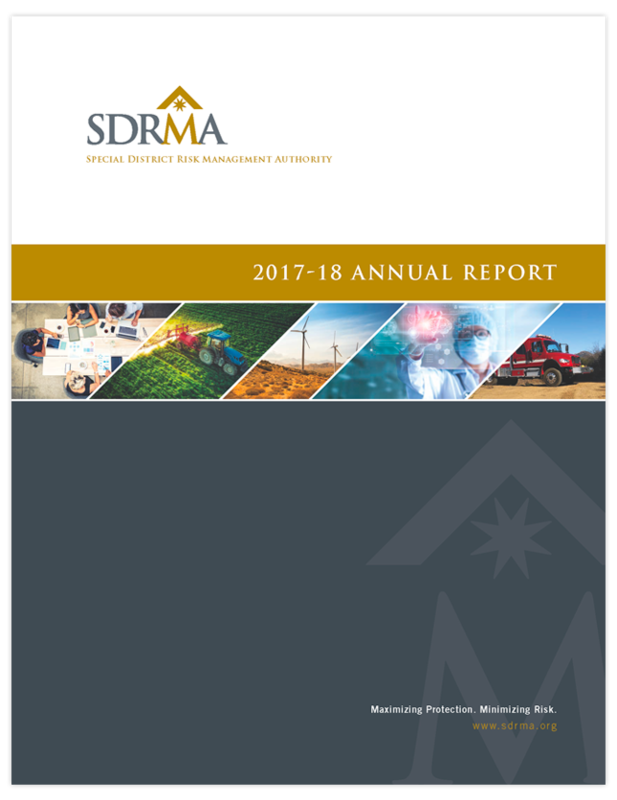 SDRMA’s 2017-18 Annual Report is available here. This report contains valuable information about SDRMA, our programs, our members and recent financial information. You can also read articles written by SDRMA staff and published in California Special District Magazine under News. The articles contain information related to SDRMA programs and coverages, recent news and laws passed affecting California public entities.